Art, Design and Media Alumni Association (ADMAA) represents the graduate student body from the School of Art, Design and Media of Nanyang Technological University, Singapore. Submit up to 5 of your best/recent works in digital format to be exhibited at the official launch of ADMAA. 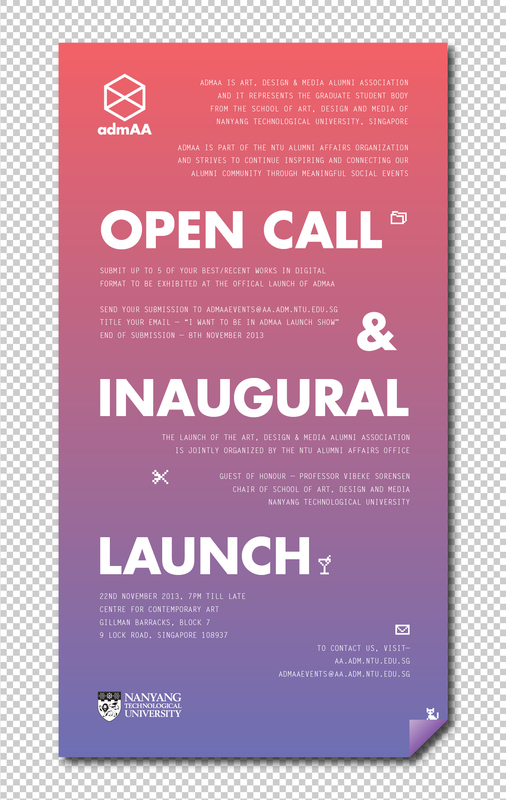 Send your submission to ADMAAEVENTS@AA.ADM.NTU.EDU.SG and title your email – "I want to be in ADMAA Launch Show"
The launch of the Art, Design & Media Alumni Association is jointly organised by the NTU Alumni Affairs Office. To receive news updates and information on events and happenings organized by ADMAA for both members and non-members, click here to join our mailing list. ADMAA accepts donations presented via cash or a cross cheque made payable to NTU ADMAA. Donations must be submitted along with a pledge form to ensure that all generous contributions are accurately recorded.